DDR3 1600 This laptop memory is rated at 1600MHz and delivers up to 12.8Gbps bandwidth per channel. You'll find it ideal for the evolving needs of today's operating systems and applications. Cas latency 9 ensure smooth system response. Superior Quality Speed is nothing without stability. That’s why Vengeance DDR3 memory kits, like all Corsair memory products, are carefully screened and tested to exacting standards. So you can compute with full confidence whatever the application is. 8GB (2x4GB) DDR3 SODIMM kit for 2nd Generation Intel Core i5 and i7 notebooks. Pros: Bought this as an upgrade for a laptop I received for free. Runs great, totally compatible, installed with ease. Pros: Name brand quality product. I'm sure it works great in a compatible computer. Cons: Not compatible with all sub-models of the Dell Inspiron N5010. Other Thoughts: Corsair Memory Finder website (http://www.corsair.com/en-us/memory-finder) lists this RAM for the Dell Inspiron N5010 'Guaranteed Compatible'. However, it is not compatible with all sub-models of the Dell Inspiron N5010 as explained by Corsair Technical Support Representative. The Dell Inspiron N5010 model comes with an i3, i5, or i7 CPU with different motherboards and different RAM requirements. Suggest contacting Corsair Technical Support (1-888-222-4346) to confirm compatibility with sub-models installed CPU prior to ordering. Pros: Worked great until this last year then started to have memory issues. Cons: Both Ram sets Just Died Contacting company. Pros: Corsair is good product. Handles exceedingly well. Cons: Did not work for my Lenovo R500. I found my error in reason to why. The Intel GM45/47 Chipset can not and will not handle the speed that these specific RAM sticks supply. GM47/47 Rev 7 can only handle speeds up to 1333MHz Dual or 667MHz Single Channel. These sticks cannot adjust to 1333 MHz, I realized after buying. Other Thoughts: ADVICE:: Do your research on your chipset and make sure it can handle such speeds as I failed to do beforehand. I have no other laptop to test these, so I'm stuck with incompatibility. Pros: I grew up with Corsair products and has yet to fail me. Until now. Cons: Seemed promising. Still with failure try with only one Stick and my laptop can run 4GB as it still currently does because these RAM sticks failed out of the box. Other Thoughts: I have a Lenovo R500 2718. and can support 8GB RAM, despite the datasheet. I have friends with same laptop and are running with 8GB. Though the datasheet says 4GB Max, I should expect boot and performance. with both or either or, I receive 1-3-3-1 beep code defining bad or no memory. I am completely dissatisfied. Pros: I'm sure it's good RAM, it's Corsair. I swear by them for a lot of stuff, half of the hardware in my current desktop build is Corsair product. Cons: Didn't work in my Dell Inspiron N5010. Other Thoughts: I used Corsair's "Memory Finder" tool on their site. It tells me this kit is compatible with a Dell Inspiron N5010. 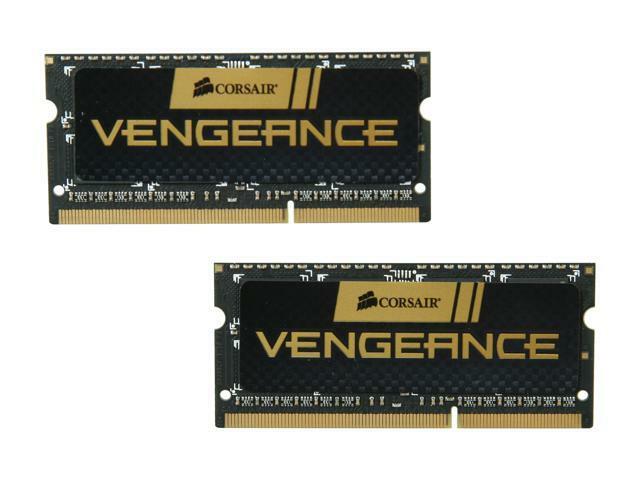 Found the RAM kit at Newegg and it was around $20 or so cheaper (give or take a few bucks), so I ordered through Newegg instead of Corsair directly. - BIOS in laptop is most current version available - A15. - BIOS recognized/acknowledged all 8192 GB, though running at 1066 MHz due to limitations of the system, which I had partially anticipated. - Shuts itself down with no warning during boot attempt from a Windows 8 setup DVD. - Shuts itself down with no warning during boot attempt from Parted Magic DVD. I reinstalled the original 2x2 GB modules (Micron MT8JSF25664HZ-1G4D1), and the laptop booted to Windows 10 and worked fine. Same goes for the Windows 8 setup DVD and Parted Magic DVD, everything worked perfectly. $37.99 purchase price for product. $5.70 restock fee from Newegg applied. $23.37 refund due after restock fee. $10.40 to ship back to Newegg standard UPS. $12.97 back in my pocket and egg on my face after all is said and done. Shame on me. EXTREMELY disappointed with this whole experience. Comments: The old RAM was 2x2gb Samsung PC3-8500. The Intel chipset I have supports up to 1333mhz and these chips downclocked just fine and the extra speed was noticeable along with doubling my physical RAM. Laptop is used for streaming music and videos, along with Internet and bookkeeping use.